Navy defensive end Paul Quessenberry, a legacy whose father graduated from the Naval Academy in 1980, is finishing off his college career about as well as it can be scripted. The 6-foot-2, 251-pound senior two-year starter from Carlsbad’s La Costa Canyon in suburban San Diego is home to play San Diego State in the San Diego County Credit Union Poinsettia Bowl Tuesday at Qualcomm Stadium. A week and a half ago, moments after he helped Navy beat Army for the 13th straight year, Paul was one of three Midshipmen quick to hoist Navy head coach Ken Niumatalolo to their shoulders. They gave him a celebratory ride to mark his 61st career victory, making him Navy’s all-time winningest coach. Paul’s father David, mother Maureen and two brothers David Lee and Scott were all in attendance at M&T Bank Stadium in Baltimore. They had attended Army-Navy Games in the past, but this was the first time all three boys and their parents were together – albeit with Paul on the field. David Lee, the oldest, is in his second year with the Houston Texans, although he’s not on the roster this season while recovering from non-Hodgkins Lymphoma. The 6-foot-4, 307-pound offensive tackle was a three-year starter at San Jose State that was taken in the 2013 NFL draft in the sixth round. He was one of three finalists for the 2012 Burlsworth Trophy that is presented to the nation’s top player who began his career as a walk-on athlete. Penn State quarterback Matt McGloin won it. 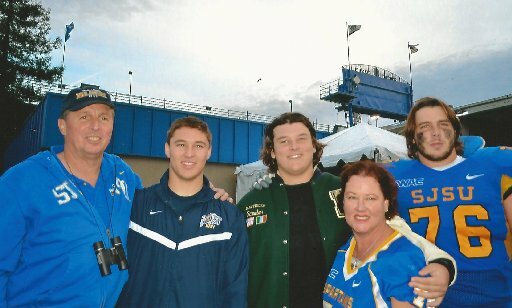 When David Lee was a senior in 2012, San Jose State beat Navy 12-0 at Navy Marine Corps Memorial Stadium. Paul was a junior in his first year as a starter, meaning they butted heads on the field. Scott, a 6-4, 280-pound offensive tackle at UCLA, is a second-year starter as a true sophomore. He was one of the top recruits in the nation in 2013. With the Army-Navy Game featured a week after the rest of college football finishes play other than the upcoming bowl games, Scott was able to attend. In addition to Navy’s annual games against Notre Dame, the schools played their 2012 opener in Dublin, Ireland. His parents attended that game, too. All that is more than any player or family can ask for, but there is one more sentimental conclusion to close the circle of his Navy football career. The only Quessenberry missing will be David Lee, who has to remain in Houston. Due to his weakened immune system from chemotherapy treatments, he came down with a fever at the Army-Navy Game and had to be taken to the hospital. He’s recovered but been advised not to travel. For David Sr., a former Navy pilot, he says the best part of his middle son’s final season has been how he’s embraced the Navy Academy. Paul will be commissioned a Marine Corps 2nd lieutenant upon graduation. "Before this year I would have told you Paul was a football player who went to the Naval Academy,” he said. "But this year he’s a Midshipman who plays football for Navy." Paul has a five-year military commitment to serve his country upon graduation, but his older brother’s cancer and the death of a teammate (Will McKamey) who died in spring football from a head injury gave him a new perspective on life and his military future. About all that Paul’s family missed from his senior season was seeing Paul hoist Niumatalolo for his victory ride. It was a brief one, with Niumatalolo later explaining he wanted down out of respect to Army’s football team. And now he’s back home for one final reward to his career and special moment for his family.